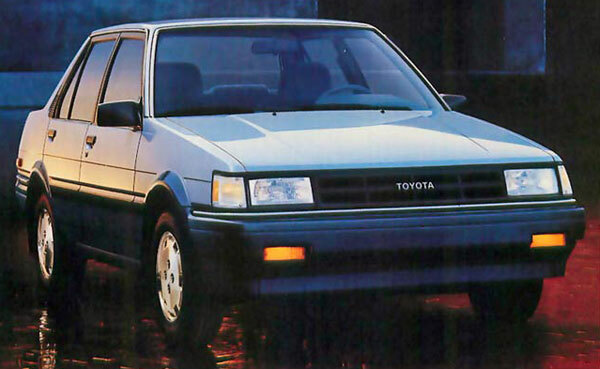 The day Toyota made our 1987 Corolla was not a Monday. Nor was it 'Fat' Tuesday or flex Friday or 'hump' Wednesday or any other distracting day of the week. It was a day of focus. Surely it was a morning of mental fortitude and an afternoon full of anticipation for what would be crafted during that day's shift. It was another normal day, like any other day. Yet at the end of that day, what emerged from the plant was something entirely abnormal. The little brown car's early life was punctuated by...well, nothing at all. Under the gentle tutelage of an elderly, single, lady-owner it putted along for about 15 years, likely never knowing the 'thrill' of reaching triple digits per hour. Merilee's sister Julie – known for her 'defensive' driving – then managed in one year, to teach it everything it hadn't learned in the previous fifteen. Julie kindly gave us the car in 2005. We drove it from the East coast to Ontario and then through four more provinces, and a few states, arriving in Three Hills, Alberta – not only in one piece, but raring to go. That little Corolla faced harsh -50°C Alberta winters without so much as a complaint. In fact it was know to be out boosting other cars in such conditions. And when the snow would pile up, preventing other, bigger trucks from negotiating the deluge, Corolla would zip in and out, here and there, as if the snow were mere packing popcorn. Lest you wonder, "Why all the lavish praise for a car; a material object?" There is something surprising about a rusty, brown, dented, loud 24 year old car performing like that though. It has been a perfect witness of the providence of God. The Corolla never did, and frankly never could, take credit for it's longevity. It was obvious to all who witnessed it driving by that something supernatural was going on under the hood – and not in the driver's seat or back at the factory. Oh to be, in my weakness, as clear a witness of the creator's sustaining presence in my life. Well it finally died (the week I finished at the airport in fact)...well the brakes died, and the exhaust fell off, and the hand-brake hadn't worked in a while and the electrics through the dash have been out for a few years now. But the engine was still going strong; at 220,000 it had lot's of legs still to go. And what reward does our dear Corolla face? Right about now, a dozen troubled teens, on the road to recovery, are tearing it apart for scrap and parts.